Announcement Get a FREE Reproduction Postcard with any mailed order. 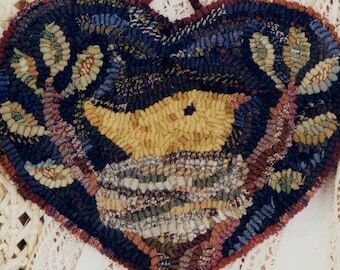 HINTS FOR NAVIGATING MY SHOP: click to the left under the SHOP SECTION you are interested in such as RUG HOOKING PATTERNS. You can also use the SEARCH box and type in a key word to get to an item such as "prodding" or "rose" or "santa" or "hook". New PDF pattern downloads! Buy it today and print it out the same day so you can start working on your project! Instant gratification! Thanks for stopping by my shop! Check back again for new listings. Make me one of you favorite shops by clicking the heart icon and get emails of new items. Get a FREE Reproduction Postcard with any mailed order. 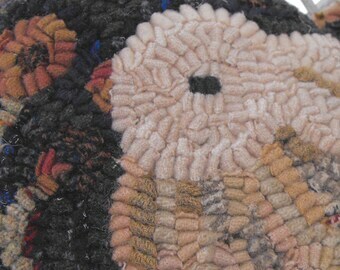 HINTS FOR NAVIGATING MY SHOP: click to the left under the SHOP SECTION you are interested in such as RUG HOOKING PATTERNS. You can also use the SEARCH box and type in a key word to get to an item such as "prodding" or "rose" or "santa" or "hook". Good little book to carry in my Hooking tote. I’ve admired this pattern for a long time and finally decided to go on and purchase it. The seller, Karen Kahle, is always a pleasure to work with. She quickly answered my questions and sent the package right away. It arrived more quickly than I expected. The pattern lis lovely and lively and beautifully drawn. It was sweetly wrapped and specific tips were supplied. Totally, completely, absolutely pleased with my purchase. 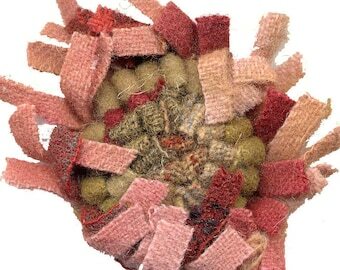 SPECIAL ORDER for Darla E.
Like an artist at a canvas I need a paintbox of wool colors to hook my rugs. Hundreds of colors can go into a design. Many creative decisions happen in making my prototypes, and I often make design and color changes along the way. I love working at my large floor frame which helps me to see more of my work in progress as I hook. Built in 2011, my lovely new studio means that I can work surrounded by my hand-dyed colorful wools. Here is one shelf! Ever an inspiration, I enjoy nature and looking out my studio window at my herbs and flowers and vegetable garden. 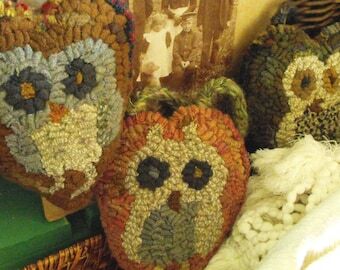 Many years ago I became captivated with hooked rugs when I saw an article in a magazine. I knew I wanted to delve into this new craft, but with little kids and too many other hobbies it got put on my 'some day' wish list. Ten or so years later, my kids had grown up and my life had dramatically changed. I revisited my desire to try rug hooking. I loved how relaxing the whole process was and how I could express myself similar to painting a picture, except using colorful wool. For me it was love at first rug and I haven't looked back! I was inspired by the look of vintage primitive rugs and designed several for my own pleasure. I had the thought to start my own pattern company, but having a full time job meant I would have to create my designs in my spare time. Ideas kept coming and after I had some prototypes ready, I put my stuff out there for the world to see. Starting with my first catalog in 2000, Primitive Spirit has grown from selling a handful of rug designs, to over 80 patterns, and self publishing books and my own DVD on color. 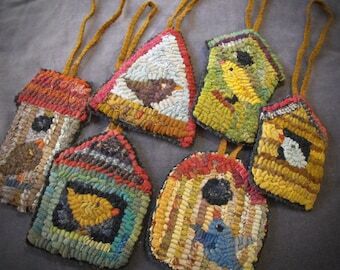 The rug hooking community seemed to say YES! 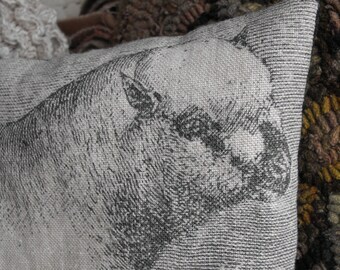 to my pattern company, and my distinctive new "old" look immediately took off. My decision to open an etsy shop has opened the new possibility of adding PDF instant downloadable patterns to my repertoire, which is a boon for my customers. Now you can see a new pattern and be hooking it that same day! Like the travelers on the Oregon trail of long ago, I am a transplant from New England and now live in the Pacific Northwest. Creating rugs are my way of having one foot in the here and now and one foot in another century. Something feels right about that to me. How fortunate for me to be sharing my vision in my creative work. Rug hooking and color are my passions. I adore all things vintage. 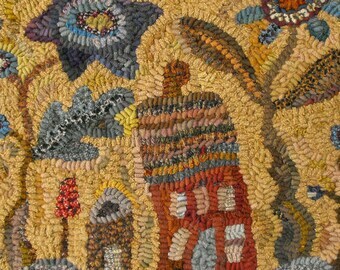 When I create a rug design and dye the wool to hooking it, my love for the timeworn colors of yesteryear comes through. let creativity be a way of life! Buyers are responsible for shipping costs. If the item is not returned in its original condition, the buyer is responsible for any loss in value. payment is through paypal, credit card or etsy gift card. shipping fees include a handling charge which reflect etsy seller fees. on the occasion when this is over calculated, a partial refund will be given. When a package is shipped internationally, it may be subject to import taxes, customs duties, and/or fees imposed by the destination country.